A while back I wrote a post praising Thule for the amount of thought that went into their very well designed Messenger bag for 15″ Macbooks, which I had purchased based on the high reviews (4.5/5 stars) it received on the Apple store. Recently a new co-worker (the illustrious @miriaweidner), was asking what laptop bag I had chosen and I recommended the Thule bag. My enthusiasm and blog post made it back to the good folks @thule. Not long after, I received a gift box from them that contained not one, but three durable, well designed Thule products. I’ve been trying them out, and like the laptop bag, these items are well-made and slick looking. Thule has done a nice job here. First off, it is custom sized for the 13″ MacBook Air and there is felt on the inside, so the laptop slides easily in and the aluminum isn’t scratched. What really sets it apart though, is the seamless rubber material it is made from. Additionally, when you slide the Air in, it goes well below the sleeve edge, which folds over. There is no way that water (if you are walking in the rain between meetings/coffee shops/waiting for a cab) could get in. The sleeve is also tough, holding it you feel like you could drop it on the sidewalk and all would be ok.
As a test, because I am thorough and cruel, I held the sleeve under the shower. As hoped, while “rain” slid in underneath the “lid”, the design kept any water from getting into the actual laptop enclosure. 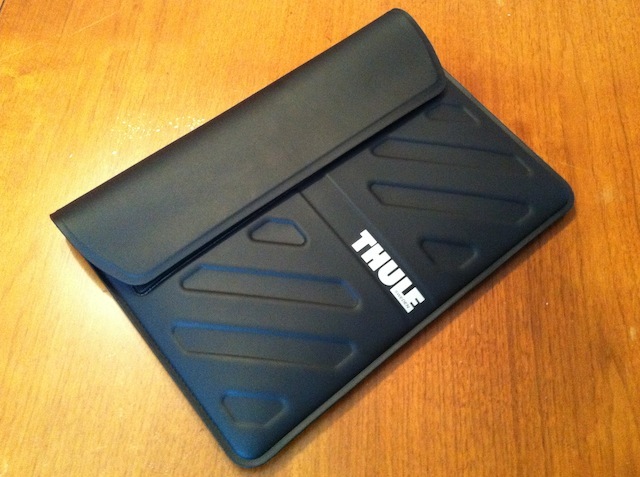 Thule calls this product a sleeve, but I’d refer to it as a case. The zipper has a plastic enclosure so that water can’t seep in between the teeth or seam. Like the MacBook Air sleeve, it is made out of a rubber material and you feel like your MacBook could survive a fall. My favourite touch with this product is that you can use it without pulling your MacBook out. So if you are at a sticky coffee shop table or in an airport lounge, you just zip it open and flip up your MacBook lid (see photo). My only critique is the metal Thule tag on the outside of the case. It isn’t needed and feels like it is going to scratch or catch on something. Again, in the interest of being thorough, I dunked this case in the bathtub a few times. It was clear when I opened it back up that moisture had seaped in at all four corners. Now, it still performed well enough that your laptop would be protected from a coffee spill or quick drop in a puddle/run in the rain. In Thule’s defense, they clearly state that the case is Water Resistant, not Water Proof. This pack belongs to the same family of bags as the messenger bag I love so much. The fabric feels tough and the zippers well made. There are a slew of pockets and they are well placed. The feature that really sets this bag apart though is the lockable top pocket, which has a hardshell designed to hold your sports sunglasses and phone. I wear prescription Oakleys which normally require hauling a bulky case. Great, great feature. All three products state proudly on their tags that they are guaranteed for 25 years. I don’t foresee having laptops 25 years from now, but that is an impressive committment to quality. Obviously I was pleased to receive some free Thule products in the mail. Staff at Thule heard about what a fan I was, saw that I was talking about them online and then did something to reward that. The products came with no request I talk about them, no insinuation that I should post about them. They found a fan, gave him special care and knew that if you make a good product fans like me will reward you. Speaking as someone who works in the Social Media world, that is a great example of how to run an influencer program. Have an opinion on Thule products or this post? Let me know below.